Intuit’s QuickBooks is a popular choice for business accounting, but if you accept credit cards through Intuit merchant services, you’re well aware that it comes with high costs. What you may not know is that you can use a lower cost processing option and still automatically input your sales data into QuickBooks. It’s the best of both worlds: the convenience of QuickBooks and more competitively priced credit card processing.There are many processors that offer integration with or data export for QuickBooks, eliminating manual transaction entry. However, different processors utilize different integration methods and some may not work with your version of QuickBooks.In this guide, we’ll explain the different options for QuickBooks integration and show you how to find the right option for your business. Should I use QuickBooks Payments to process cards? Firstly, it’s important to understand the different QuickBooks solutions. 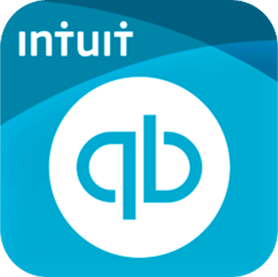 Intuit offers three distinct QuickBooks services: accounting software, payment processing, and point-of-sale software. These three services can be used together or individually. QuickBooks accounting software is what most businesses are referring to when they talk about QuickBooks. The popular software includes features to manage accounts payable, track sales and expenses, create invoices, create tax reports, and more. QuickBooks Online also falls into this category. 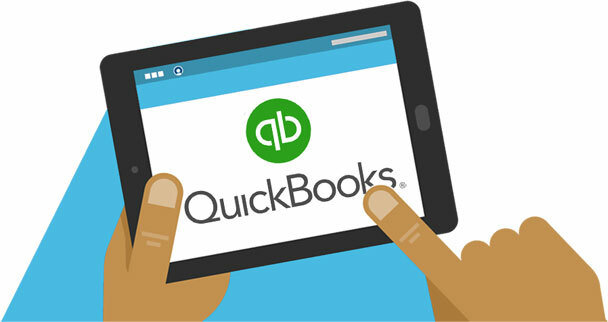 Many businesses use QuickBooks accounting software independent of any other QuickBooks services. QuickBooks Payments is the payment processing branch of Intuit QuickBooks. You can use it to accept payments online, with a mobile device, or by sending an electronic invoice. Additionally, you can accept ACH bank transfers. If you use QuickBooks Payments and QuickBooks accounting software, your transactions automatically sync. You do not need to use QuickBooks Payments in order to use QuickBooks accounting software, nor to record your credit card transaction data in QuickBooks. In fact, the purpose of this guide is to show you how to use an external processor with QuickBooks so you can avoid the high transaction costs that Intuit is known for while not giving up your accounting software. Your ideal payment processor will vary depending on your specific business needs. In our experience, pricing for Intuit merchant accounts is not competitive. QuickBooks Payments is very likely more expensive than your current processor or other available processors. Taking credit cards isn’t cheap, and you don’t want to spend more than you have to. Be sure to request quotes from different processors or sign up for free at CardFellow to quickly and easily compare rates available to you. Point of Sale is Intuit’s software solution for accepting credit card payments when the customer is present with their card, such as in retail stores or restaurants. 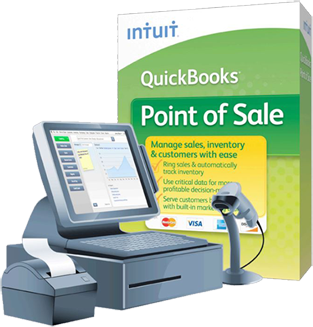 QuickBooks Point of Sale software can be used on a point-of-sale system powered by Revel or with compatible desktop computers. QuickBooks Point of Sale technically does not require using QuickBooks Payments, but it only directly integrates with Payments. This means that if you choose to use QuickBooks Point of Sale software with a different payment processor, you will have to manually enter transaction information. It’s not advisable to use QuickBooks Point of Sale without also using a QuickBooks Payments merchant account for card processing, and it may not be necessary to reap the benefits of the software. 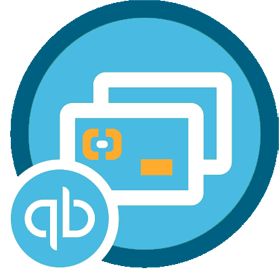 When you use QuickBooks Point of Sale and QuickBooks Payments, your data automatically syncs with QuickBooks accounting software. However, it’s not necessary to use QuickBooks Point of Sale to accept credit cards and to record those transactions in QuickBooks accounting software. In short, QuickBooks accounting software does not require you to use QuickBooks Payments or QuickBooks Point of Sale. In fact, many businesses use QuickBooks as their accounting software but choose a different payment processor and point of sale system. Let’s take a look at options to use QuickBooks as your accounting software without using QuickBooks Payments as your credit card processor and still sync your credit card transactions to your QuickBooks software. All versions provide accounting functions, but they do not allow for payment acceptance by themselves. You will need a merchant account with a payment processor to accept card payments. Manual entry is what you’re looking to avoid. While it doesn’t require any special software or knowledge to do and means you can use any processor, it increases time spent on accounting/reconciliation, and increases the likelihood of human error. Exporting and importing is a step up from manual entry, but still not ideal. You’ll export your transaction data as an Excel file and import it into QuickBooks. While it eliminates manually keying in data, it’s rarely an automatic process. Export / import requires you to initiate the export of data from your system into QuickBooks each time you want to reconcile it. An exception is PayPal, which can be configured for automatic export / import into QuickBooks Online. Many processors can offer a way to export transaction data so that you can upload it to Excel, but as it’s not as seamless as other methods, we’re not going to focus on it in this guide. If you’re specifically seeking export / import, check with your processor or gateway about that capability. Compatible POS systems offer the fewest choices. With this type of integration, the point-of-sale software must be compatible with QuickBooks software, and the payment processor must be able to support the point-of-sale software. Intuit maintains a searchable database of services that can be integrated with QuickBooks, but the choices for POS systems are extremely limited. Given that there are other options for integrating a POS system and QuickBooks through plugins and syncing, there’s no benefit to limiting yourself to one system and processor. By doing so, you’ll lose your ability to negotiate for better pricing on your credit card transactions. Plugins and gateway integration are comprehensive options that save you the most time and eliminate the risk of human error from manual entry. They also provide the most choice in terms of equipment and processors, and don’t require technical knowledge. There are two main options for integration: real-time, where you work “within” QuickBooks,” and daily syncing, where you process transactions as usual outside of QuickBooks and the plugin or gateway automatically syncs the transactions for you at the end of the day. Plugins typically incur a separate fee paid to either your processor or the third-party plugin company. Let’s take a look at these last two options in depth. A direct integration to QuickBooks through a point-of-sale system is easy, but has the least number of choices in both point-of-sale programs and payment processors. Additionally, the system simply syncs to QuickBooks at the end of shifts, meaning it’s functionally equivalent to daily sync plugins. Let’s say you want to open a retail store and use QuickBooks in your accounting department. After visiting Intuit’s database to find compatible solutions, you’ll find that your only option is AccuPOS for your point-of-sale software, so you purchase a bundle that includes AccuPOS software on a touchscreen POS system. You also purchase QuickBooks accounting software. Additionally, you’ll need a merchant account from a processor that supports AccuPOS. You’ll only have two choices – an account directly from AccuPOS or from Mercury Payment Solutions. With virtually no competition, neither AccuPOS nor Mercury has any incentive to offer you competitive pricing. When you have more options, you have leverage to negotiate a better deal. With an integrated system like AccuPOS, you’ll set up inventory in QuickBooks and then copy it to the POS system to create a cash register-style interface for employees. At the end of shifts, the system automatically updates QuickBooks with sales information. The biggest drawback is that the limited choice of POS systems and processors eliminates your ability to secure competitive pricing and doesn’t provide any additional benefit. The option of a plugin or gateway integration for QuickBooks provides more choices in payment processors. These options let you automatically sync your transaction data at the end of the business day or in real time. With automatic syncing, the solution will match fields in your QuickBooks account with fields in the gateway or payment solution to ensure data is recorded in the correct place in your QuickBooks software. Some of the most popular gateways, including Authorize.Net and the NMI gateway, offer syncing for QuickBooks when using the gateway. You may see these solutions referred to as plugins or as gateway integration, but they function the same regardless of what they’re called. Real-time plugins allow you to initiate and record payments while QuickBooks is open. Several popular real-time plugins allow you to work directly “within” QuickBooks. Essentially, when you open QuickBooks, you’ll also open the plugin, which will appear as its own window. You’ll create an invoice (or open an existing one) in QuickBooks and enter payment details in the plugin window. Plugins are available from processors, gateway developers, and third-party vendors. Plugins require a compatible gateway to function. In some cases, you can obtain a plugin and a gateway account from the same company. However, for some third-party plugins, you’ll need to set up your gateway account separately. In order to get your transaction data into QuickBooks without using Intuit as your credit card processor, you’ll need several things: QuickBooks software or QuickBooks Online, a merchant account, a gateway, and (possibly) a plugin. You may also wish to attach a card reader. You’ll need to start by identifying the version you own and locating a processor that offers a compatible solution. If you’re using QuickBooks desktop versions (Pro, Premiere, or Enterprise) or QuickBooks Online, CardFellow can help. Start by creating a free business profile to provide us with details about your business, and we’ll help you find the right fit for your needs. You have even more options. We suggest that you find your credit card processor first so you can secure the most competitively priced merchant account and gateway. Try CardFellow’s free, no-obligation quote request tool to see pricing from multiple processing companies that offer integration with QuickBooks. Once you’ve created your account, give us a call for assistance choosing the right fit. From there, you’ll be able to purchase a version of QuickBooks compatible with your chosen processor. Most of the plugin and gateway options offer the choice of swiping cards with a compatible reader or keying in the numbers by hand. You may be wondering if one option is better than the other. If you can swipe cards, you should. Companies like Magtek and IDTech offer low-cost, universal credit card readers that connect to computers via USB or Bluetooth. One Magtek reader even lets you accept EMV chip cards. Swiping cards is more secure and results in lower costs than hand-keying cards. If your customer isn’t present at your office but wants to make a payment over the phone, keying in cards allows you to collect the payment right then without having to bill the customer or wait for a check, but know that you’ll pay more to accept the card. Bottom line: If you can swipe the card, that’s the better option. At CardFellow, we recommend using services that can be transferred among different processors if necessary, and that’s true of QuickBooks plugins and compatible gateways. Fortunately, there are several options that work with multiple credit card processors, which gives you the flexibility to switch companies if necessary and to find the most competitive pricing and service. compatibility and costs for each option, but those details are subject to change. Be sure to confirm compatibility and costs with the company. As one of the most popular gateways, Authorize.Net works with many different credit card processors and includes a QuickBooks integration function, Commerce Sync, which we’ll also discuss later in the Clover options. Prior to partnering with Commerce Sync, Authorize.Net offered its own solution, called Sync for QuickBooks. The company discontinued that option in March of 2019. However, Authorize states that the new Commerce Sync solution will support all of the existing features businesses are used to with Sync for QuickBooks. Additionally, you’ll now have functions including batch summaries, enhanced customer detail (including the ability to track sales by customer), support for refunds (both full and partial), split payment capabilities, and compatibility with QuickBooks Online. Commerce Sync also provides the option to sync data from multiple Authorize accounts into one QuickBooks account – perfect for businesses with multiple Authorize accounts that want consolidated reporting data. Like Sync for QuickBooks, Commerce Sync will enable you to automatically sync your daily transactions with your QuickBooks account. The Authorize.Net sync offers a convenient way to incorporate transaction data into QuickBooks, and can be a great choice for businesses that are already processing credit cards using the Authorize gateway. You can sign up for an Authorize.Net account through Authorize directly or through a credit card processor. The company through which you sign up will set your pricing for the gateway, but Commerce Sync sets the pricing for its QuickBooks integration tool. As of 2019, Commerce Sync publishes pricing of $15/month per Authorize account. Not sure if you should go with Authorize directly or a reseller? You may not know NMI by name, but many processors white label the NMI gateway and offer it under their own name. NMI has two routes for QuickBooks integration: export / import and SyncPay. The export / import option allows you to simply export your transaction data and import it into a QuickBooks account. NMI offers this option for free, though your processor may charge for it if they wish. 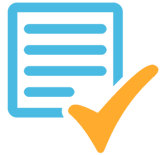 SyncPay is a more robust automatic sync tool and is compatible with desktop versions of QuickBooks. The tool allows you to initiate payment for invoices from within QuickBooks. When properly configured, SyncPay will open within your QuickBooks account as a separate window, allowing you to enter card information by keying in details or utilizing an attached card reader. 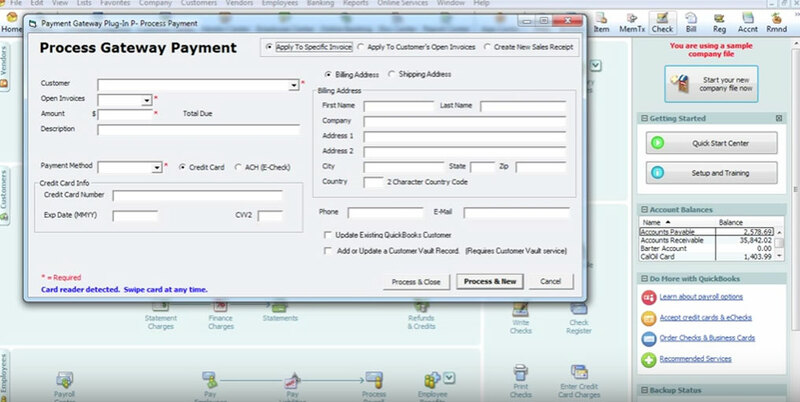 The screenshot above, from an NMI QuickBooks video, shows the SyncPay window overlaid on a QuickBooks account. The form offers fields for card details, amount, billing address, the option to save the info to a secure card vault, and more. You’ll also notice that in the bottom left hand corner, blue text reads, “Card reader detected. Swipe card at any time.” This space lets you know if your attached card reader and the program are communicating so that you can swipe cards. Once you complete the gateway payment, your records in QuickBooks automatically update to reflect the transaction. Even though NMI offers two QuickBooks integration methods, the processor sets the pricing. NMI does not directly set up businesses to use its gateway. Your processor can include the costs of QuickBooks integration in your total gateway pricing or may charge a separate fee. eProcessing Network (ePN) is one of a few companies that claims real-time integration between your card processor and QuickBooks. It’s also one of the few that can provide either gateway syncing or a plugin. The plugin is the more robust of the two choices, but if you just want an automated process to sync transaction data, ePNSync is the way to go. When you use ePN, you can easily integrate your transactions with Windows-based desktop versions of QuickBooks, including Pro, Premier, and Enterprise. ePNSync also works with QuickBooks Online, which the plugin does not. To use the sync or plugin, you’ll need to use the ePN gateway for card acceptance. You can take cards by swiping, hand-keying, or allowing customers to pay online through a secure web form. Many processors offer the ePN gateway, providing you with more choices for your merchant account while still enabling QuickBooks integration. However, that also means that the processor will set the cost for the ePNPlugIn or ePNSync solution. Be sure to compare credit card processors to ensure you’re getting the best deal. With ePN’s plugin featuring real time integration, you’ll process payments through the plugin and the ePN gateway, but “within” QuickBooks. 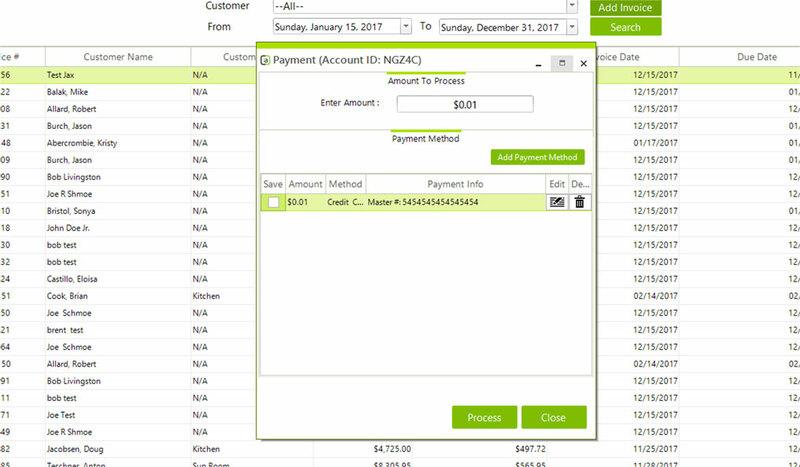 It functions similarly to the NMI integration, meaning you’ll open your QuickBooks account and launch the plugin, allowing you to initiate payment functions from your computer without leaving QuickBooks. You can create or choose an open invoice and apply a payment to that invoice. 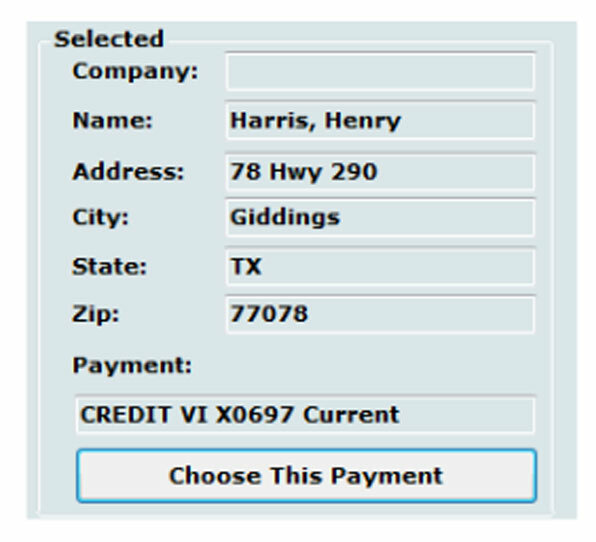 The ePNPlugIn allows and records payments made by credit card, gift card, and cash. Also notable is ePN’s support for Level II data for purchasing cards, common in business-to-business industries. If you accept a purchasing card, a screen will prompt you to enter additional details in order to help you qualify for the right interchange categories so that you don’t overpay for those purchasing cards. However, the ePNPlugIn does not support level III data, which is commonly required for cards that require even more information, such as government transactions. Understanding Level II and Level III data is crucial for B2B. If that’s you, be sure to check out our guide to B2B Transactions: Level II and Level III Enhanced Data. If you accept payments outside of QuickBooks using the ePN gateway, you can still download those transactions into QuickBooks to ensure you have an accurate record of payments. Depending on the method you use, the plugin may even auto-match the transactions to invoices for you. For example, if you accept a payment outside of QuickBooks for a transaction that already has an invoice within QuickBooks, some versions of the plugin help ensure easy reconciliation if you enter the invoice number at the time you accept the payment. 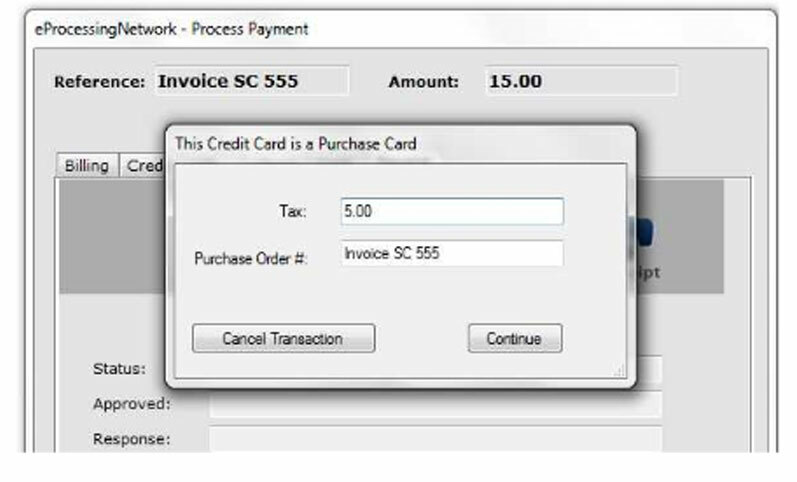 When you use the ePNPlugIn “download transactions” feature, the payment will be automatically assigned to the correct invoice. Auto assigning transactions also works if you upload an invoice to ePNBillPay or create a payment page through ePNWeb Order Generator to allow customers to pay their invoice through a secure form. Like NMI, the ePNPlugIn offers a secure card vault for keeping credit cards “on file” without actually storing card numbers yourself. 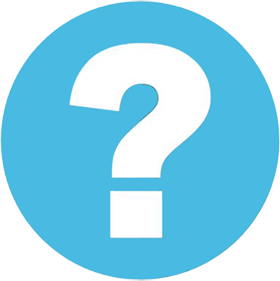 Once you enter a customer’s card details the first time, the card can be stored for future use by searching for the customer. The system will only show you partial card numbers and a status to determine if the card is current, as seen in the confirmation screen image below. Additionally, ePN offers a thorough guide to QuickBooks using the ePNPlugIn. The other option, ePNSync, is a simple solution that allows you to process transactions outside of QuickBooks and automatically download those transactions into QuickBooks. This process eliminates the need to manually enter transaction details. To use ePNSync, you need to use the ePN gateway and a compatible version of QuickBooks. 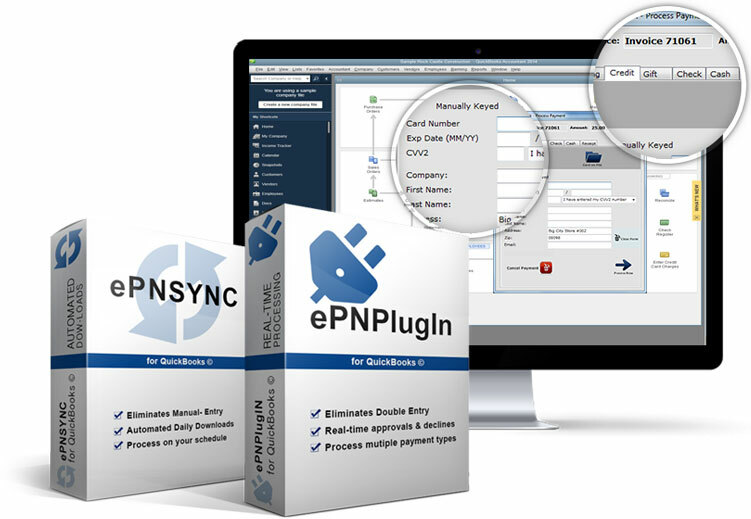 Unlike the ePNPlugIn, ePNSync is compatible with QuickBooks Online. In addition to the intro video above, ePN offers a collection of training videos on ePNSync. 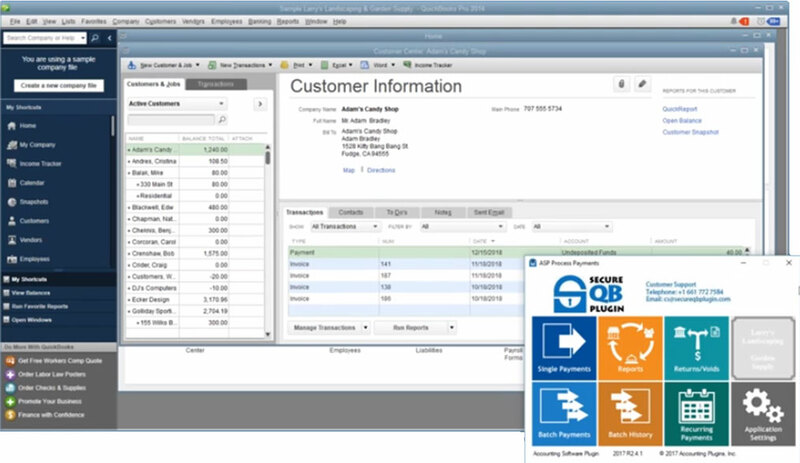 Secure QB Plugin is another option that claims real-time QuickBooks integration. That means that instead of relying on end-of-day syncs or file export / import, the plugin records your transactions to QuickBooks as they happen. The company told CardFellow that the plugin is very stable as it was created years ago and written to the “main SDK” for QuickBooks. Official SDKs provide information on programming best practices and detailed information that allow developers to create peripherals (like plugins) to connect to a program. Companies that offer SDKs are essentially encouraging third parties to enhance the functions of their product. QuickBooks does still currently provide SDKs through its Intuit Developer platform but may have limited functions like direct real-time integration with payment systems. Secure QB Plugin white labels its solution for several major banks and processors, but you can also obtain it yourself without going through another company. The plugin screen in the bottom right corner allows you to chose from options such as single payments, batch payments, recurring payments, and more. Once you click on an option, the appropriate window will appear to enable payment acceptance. If you choose the single payments option, you’ll be able to accept a card for a new or outstanding invoice. Even though you’re not in the recurring payments screen, you’ll also have the option of saving that card for future use. Secure QB Plugin also offers a “walk-ins” payment function not readily found with other plugins. The “walk-in” function allows you to accept and record a payment without assigning it to a specific customer or invoice. This makes it a smoother option for situations in which you’re not invoicing clients nor expect to create a regular relationship, but still want to sell an item or service and record it in QuickBooks. Practically speaking, you could set up a similar process through the other plugins by creating a customer file for walk-in clients, but it’s pre-made for you (and featured as a choice in the payment screen) with the Secure QB Plugin. Additionally, this plugin offers the option of batch payments. If you need to charge a group of clients, you can do so in a single batch if you have cards on file. This feature is useful for businesses that bill clients on a membership model with a fixed weekly, monthly, or annual charge. For example, if you run a gym that has 50 clients on a $30 monthly membership, you could use the batch payments function to charge those 50 clients for their monthly dues instead of initiating an individual charge for each client. Secure QB Plugin is an example of a third-party plugin that is not also a gateway, meaning that you’ll need to choose a compatible gateway to use it. Fortunately, the plugin is processor agnostic and compatible with many different gateways, including Authorize.Net, Converge, USAePay, and more. It works with Windows operating systems and is compatible with desktop versions of QuickBooks, including Pro, Premiere, and Enterprise. Some processors offer Secure QB Plugin under other names, so you may be able to get it from your processor. Alternately, you can obtain the plugin directly from Secure QB Plugin at retail rates, starting at $29.95/month and ranging to $49.95/month, depending on the total number of users. Note that the list of compatible processors / gateways is subject to change. Be sure to check directly with any company you’re considering prior to signing up. The company’s website shows that Verosa works like other options that allow you to take payments “within” QuickBooks. Like other options, Verosa allows you to key in card numbers manually or attached an optional card reader to swipe cards. The payments post against an open invoice, ensuring that your records are up-to-date. Verosa only works with desktop versions of QuickBooks (including Pro, Premiere, Enterprise, and Accountant) and is not compatible with QuickBooks Online or QuickBooks for Mac. You’ll need a 2009 or later version of QuickBooks running Windows 7, 8, 8.1, or 10. Read more about Verosa for QuickBooks integration. InstantAccept calls itself a QuickBooks point of sale system, but it is not the same thing as the Intuit-created QuickBooks Point of Sale discussed earlier in this guide. Rather, it functions much the same way as the NMI SyncPay option – it’s both a gateway and a real-time integration with QuickBooks. You’ll work through an InstantAccept window to accept payments and automatically record transactions. You can also accept payments through mobile devices or online forms and record those payments automatically in QuickBooks. Interestingly, InstantAccept’s website states that you’ll create invoices through InstantAccept without opening QuickBooks, which is the opposite of how other real-time integrations work. We’ve reached out to InstantAccept for more information on the benefits of that and will update this section as more details are available. In any case, the process is similar to other options: You’ll create invoices and apply payments by keying or swiping cards. Your processor will set the costs for your InstantAccept/QuickBooks integration. A certified QuickBooks advisor, Fi-Soft is a company that offers real-time credit card processing integration for QuickBooks. Several processors and gateways offer Fi-Soft, including USAePay. Fi-Soft is not a gateway, which means you’ll need a compatible gateway in addition to a merchant account in order to accept credit cards and transfer the data to QuickBooks. The Fi-Soft Merchant Edition solution allows you to utilize Fi-Soft for QuickBooks integration with a number of credit card processors and gateways. That gives you the flexibility to find the right processor and still eliminate the hassles of manual transaction entry into QuickBooks. With Merchant Edition, you’ll perform functions “within” QuickBooks, similar to how other real-time plugins function. 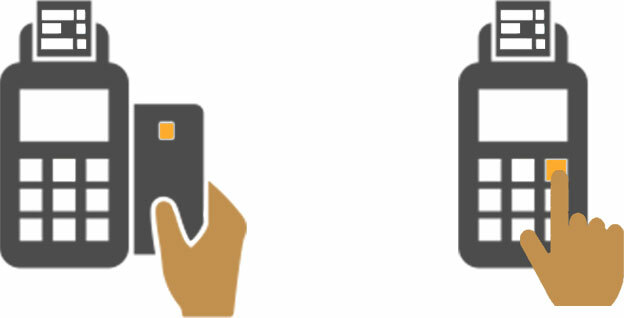 You can apply payments to invoices and optionally connect a card reader to swipe cards rather than hand-keying. The PayGuard feature of the service allows you to securely store cards in a vault for future payments. In addition to the basic real-time features, Merchant Edition offers the option of add-on modules to allow you to customize the perfect solution. Add-on modules include other payment methods: email, online, and mobile. The Email Payments add-on allows you to email invoices that contain an embedded payment link to your clients. When they pay, the transaction downloads into QuickBooks for easy reconciliation. The Online Payments add-on lets your customers make a payment through a secure, dedicated payment page with your business branding. Those payments also download into QuickBooks. The Mobile Payments add-on lets you use your smartphone (running Windows 6 or higher) to process payments while you’re on-the-go. Transactions through the Mobile Payments module download into QuickBooks. Fi-Soft’s cloud-based solution – called Business Portal – offers similar capabilities as Merchant Edition, but for QuickBooks Online. The solution syncs data every 5 minutes by default, but you can also manually initiate syncs. With Business Portal, you can create orders and receive payments without having to enter your QuickBooks Online account. You can also offer customers a self-serve payment portal branded with your company name and logo. The payment portal lets customers view or pay their outstanding invoices at their convenience. If you’d rather email invoices to clients, you can do that as well. Email invoices include a “Pay Now” link to encourage immediate payment. Fi-Soft Merchant Edition is compatible with Windows-based editions of QuickBooks Pro, Premiere, and Enterprise versions 2006 or later. Business Portal is compatible with QuickBooks Online. Neither solution works with QuickBooks for Mac or QuickBooks Point of Sale. Both options allow a choice of processors/gateways. On its website, the company refers to Merchant Edition as a “subscription-based service” but doesn’t provide further details about the costs. We’ve reached out to Fi-Soft and will update this section as more information becomes available. Another plugin that works within QuickBooks itself, PaymentCollect integrates with all QuickBooks options: POS, Desktop, and Online. As with the other plugins, PaymentCollect doesn’t support QuickBooks for Mac. It may be possible to use it with a Windows emulator. 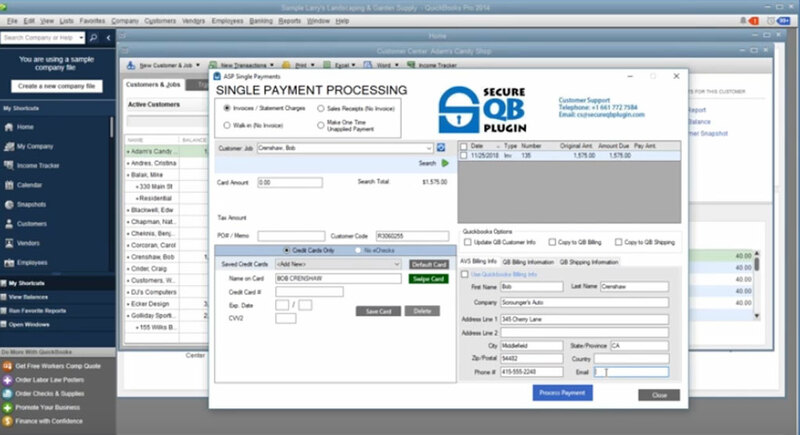 CardFellow had the opportunity to see the plugin demonstrated in the different QuickBooks solutions. It functions smoothly and with easy to use payment capture methods. Payments are automatically applied to invoices in QuickBooks for seamless accounting. Cards can be saved in a secure, tokenized method for future use, and you can process payments as well as refunds. Payment reversals can be done directly in QuickBooks so that the QuickBooks record always matches your transaction records. In QuickBooks POS, you’ll simply process transactions by choosing the payment type (cash, credit, other) for the order. If you choose to connect a credit card machine, you’ll be able to swipe the card (or “dip” it if you use a chip-capable reader to accept chip cards) and see the status of the transaction right on screen. When using QuickBooks Desktop software, you can take cards right in QuickBooks. You’ll see an additional PaymentCollect choice in the dropdown menus, which will give options including payment/refund, manage stored cards, and more. As you can see from the screenshot above, there’s also an option for “Process Open Balances.” This function allows you to quickly apply payments to any outstanding balances from customers with cards on file. This function is particularly useful for businesses that process payments on a regular schedule, such as for monthly memberships. When you use this feature, you’ll see a list of customers with outstanding balances as well as the card that will be used for the payment. If the customer has multiple cards on file, you’ll see a dropdown in order to choose the correct card. If, for some reason, you don’t want to apply a payment for a specific customer with an open balance, you can simply uncheck their invoice and a payment will not be applied. The customer will show up again the next time you use the open balances function. PaymentCollect is one of a few plugins that integrates with QuickBooks Online as well. You’ll get the same real-time transaction posting as with other integrations, eliminating the need for double entry. For businesses that accept commercial cards, providing level 2 data can result in lower processing fees. PaymentCollect can supports level 2 as long as the processor you work with can pass level 2 data. Read more about B2B credit card processing for full details on level 2 data and how you can save money. PaymentCollect is “processor agnostic” meaning you can use it with multiple different processors. If you intend to swipe credit cards (rather than key them in) PaymentCollect prefers PAX terminals. In some cases, the company may be able to set you up with other brands, but PAX is the preferred equipment. You’ll still sign up for the plugin through PaymentCollect and fees for its use will go to them as well. PaymentCollect publishes costs to use the plugin of 0.1% plus 5 cents per transaction. These costs are on top of the fees your payment processor charges, which PaymentCollect does not control. The popular Clover systems are known for being customizable through the Clover App Market, where you can choose third party apps on tasks ranging from loyalty programs to timeclocks. That’s also how Clover handles QuickBooks syncing. The Clover App market boasts two apps that allow syncing your Clover and QuickBooks: Commerce Sync and Better Sync. Both options offer daily automatic syncing. Commerce Sync transfers your daily sales information into QuickBooks. In advanced versions, you can set sales by category to transfer into accounts according to your Clover categories or track sales by customer. The app also tracks payment method of each sale, so cash and credit is denoted. You can even transfer tips, refunds, and discount information. It works with Online and Desktop versions, including Pro, Premiere, and Enterprise, and on any Clover system. Your other choice is Better Sync, which comes in one version that currently costs $14.95/month. The company automates transfer of sales, tips, and discounts similar to Commerce Sync. It plans to offer an advanced option that includes syncing by category in the future, but it’s not available yet. Once you set up the account to which you want to sync information, Better Sync will automatically create the invoice and an offsetting payment record for you in QuickBooks. Of the two, Better Sync is slightly more limited, but at a lower cost it’s a good option if you just need a basic transfer to QuickBooks from your Clover system. The biggest pro to a Clover plugin is that you won’t have to switch POS systems if you’re already using or plan to use a Clover system. Additionally, Clover Stations work with any processor on First Data’s platform, meaning you’ll have plenty of choices when it comes to finding the right processor. Just remember that Clover Stations can’t be reprogrammed, so make sure that when you buy a Clover system, you’re going to stick with the processor for awhile. The primary con of a Clover plugin is the additional monthly fee. However, eliminating manual entry saves time and limits human error, making the cost well worth it for many businesses. If you’re considering a Clover, take advantage of CardFellow’s protections. Find your Clover-compatible processor through us, and rest easy knowing that you’re covered by a lifetime rate lock, no cancellation fee, and free ongoing statement monitoring to ensure you never overpay. Try CardFellow’s quote tools for free, with no obligation. See pricing for Clover-compatible processors. If you’re already using Intuit or another processor and think you’re overpaying for credit card processing, you can switch processors and continue to integrate with your QuickBooks account. Since many plugins and gateway integrations aren’t proprietary to a particular processor, you may even be able to continue to use the same plugin or gateway, ensuring minimal disruption and retraining for your accounting staff. To find out if you’re overpaying, start by using a quote comparison tool to see baseline pricing tailored to your specific business. You’ll be able to easily see pricing stacks up and if you have questions, CardFellow’s experts are on hand to help. You can even request an independent analysis to get detailed information on possible savings. When it comes to QuickBooks and credit card processing, there are plenty of options. While a basic export / import may work for small businesses, plugins and gateway integration offer a more seamless experience without requiring advanced technical knowledge. The wider availability of plugins today ensures that almost every processor and gateway can offer integration, but you’ll still need to ensure compatibility with your specific version of QuickBooks. and more. We connect you with a range of processors that offer QuickBooks integration and can help you find the perfect solution at the right price.